A complete double page spread that shows the sound spread across the spread which has been integrated in the illustration. 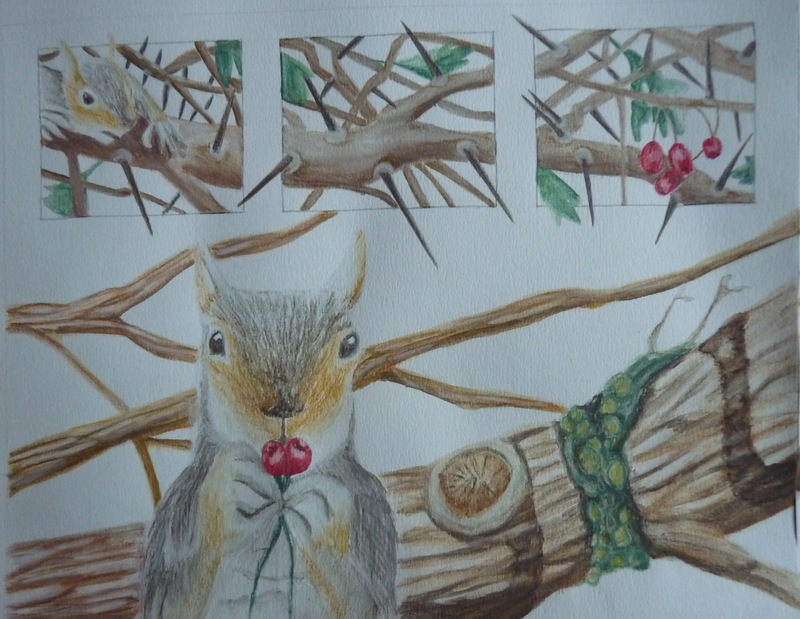 The small three squares show the difficulty of the squirrel getting through the sharp thorns of the Hawthorn bush. You then see him with the fruit in-between his paws about to snack on them but suddenly he hears this noise which is spread across the page. The noise is integrated into the bark using natural elements to define the letters and so it was subtle and looked natural. The grumble sound carries on travelling across the page which leads the eye onto three more boxes which shows the squirrel running away. 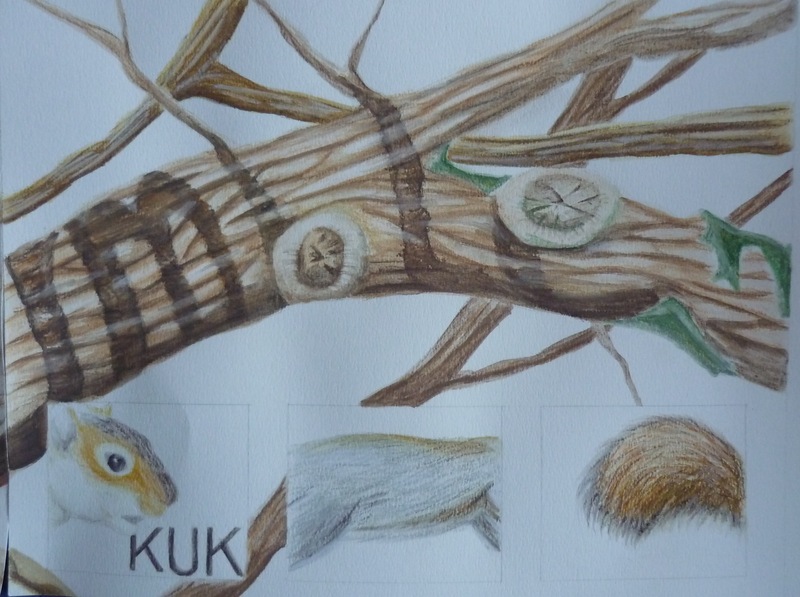 KUK is the alarm call of the squirrel and so this is some of the educational information that is being integrated into the text and illustrations. I felt I had drawn the bark of the wood alright by using pastel pencils and watercolours. I wasn’t sure about the three boxes as I felt they weren’t defined enough as a separate area. 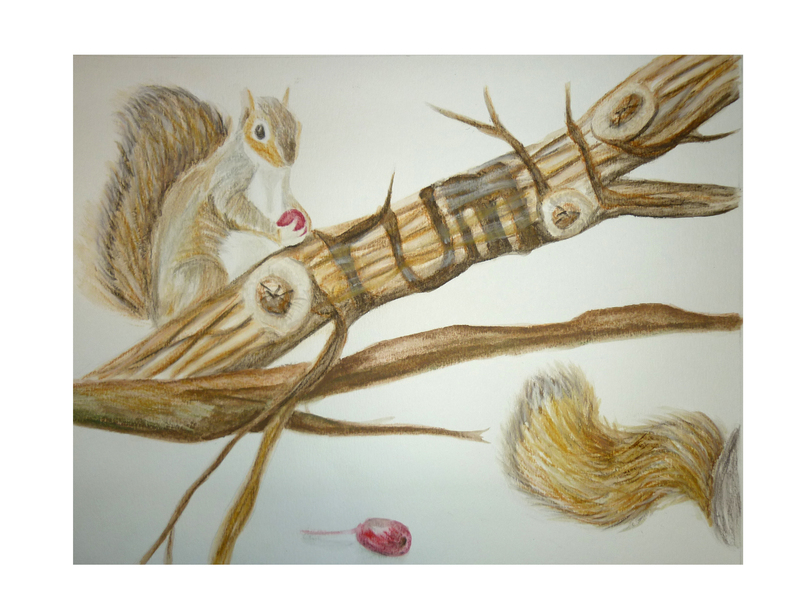 I separated the two scene making the squirrels battle through the thorns more prominent by using various shaped borders to highlight the squirrels goal. One branch carrying onto the next page which then creates a similar design as the previous double page spread. Taking out the squares and creating two separate large images and partially interlink. The berries are a demanding red, clearly showing the reader the goal of the scene. I created us usual borders to make the scene more interesting and to highlight the area of interest. I feel the squirrel at the top has subtle emotions but not enough to be easily read at a glance and so I feel like I need to add more emotions into the personality of the characters. Again I have used the detail of the bark to create the sound. I am pleased with the colours and warmth I have attained using pastel pencils but I feel there is a lot of white space and it could have an injection of another colour. I understand most of them when looking back at these pieces and as someone mentioned, they are really nice illustrations but they could be pushed and made into something better.